(Charleston, S.C.) – 3/23/2019 – The SCPoliceCruisers team recently announced a decision to expand our database by including updates that feature noteworthy law enforcement vehicle graphic and equipment packages from various regions of the country. This new addition is designed to spotlight trends that have not yet made their way to South Carolina in order to provide our viewers with the highest quality content and most up-to-date initiatives occurring within the law enforcement community. After coordinating with several agencies, we’re proud to maintain that commitment by including several new additions to the database from Georgia and Maryland. These can be found in the “Out Of State Agencies” portion of the database. The SCPoliceCruiser mission is to showcase the Palmetto State’s finest. In our most recent trip report, members of our team visited the Beaufort County portion of the state to hi-light the tremendous work being done in this region. During our visit, we were provided with exclusive access to the U.S. Marine Corps Air Station Beaufort Provost Marshal’s fleet as a joint initiative to highlight the open positions currently available at the department. In addition, we coordinated with the Port Royal Police Department and the Beaufort County Sheriff’s Office to showcase their newly acquired vehicles from the 1033 program. 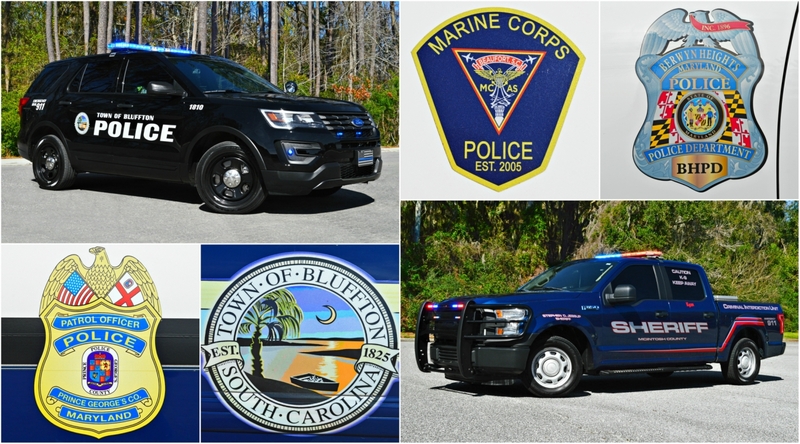 Lastly, our team coordinated with the Bluffton Police Department to photograph its fleet of vehicles to include a recently unveiled graphics package. The agency, which previously ran a fleet of navy blue cruisers has transitioned its new fleet of Ford Utility’s to black while introducing a revised graphics package. The new graphics package can be found on a handful of cruisers and the “Target Zero” traffic enforcement units. As long as the vehicles are no longer under the grant then you should be able to turn them over to the fire department without issue. You will want to contact the SCLEN coordinator to confirm but you should be out of the grant by now. We are not affiliated with the SCLEN. Their number is available on google.